When Ansem SOD and Xemnas were defeated, was Xehanort recompleted as MX? And if so, why? I thought they were made from Terranort. Also, when Terranort attempted to release Terra's heart after Aqua's battle, what exactly happened? Was Terra's heart released? Nope. It just unlocked his heart, hence losing his memories and the dark guardian fading into the ground, opening the RoD. as for the recompletion, idk. Maybe he did return as terranort. Keep in mind we never saw him before there were 13 of him so he may have gone back to his original body, or splintered off when he was revived. yen sid never saw terranort in person so it was easiest to show an image of MX. Besides, its all the same thing. Personally I think it's all just so Nomura can skip the addressing the mess he made with Terra-Xehanort, Ansem, Xemnas and whoever the hell else is involved there. @imgognito_ lol that goes without saying. I was just giving the canonical answer. Except we have some evidence that the memory stuff might have been a bit more complex than him forgetting ala Blank Points & KH3D's opening. Of course, nothing confirmed so not even worth thinking about until there is more to go on. Not that I like taking Xehanort literally since he isn't the most honest character, but Young Xehanort already stated that the Master Xehanort we see in KH3D is the most current form of himself. If that were not true, Master Xehanort would not have been the last to appear and end the time travel loop (or whatever you want to call it) in their most "present" time. The old man we see is the Xehanort that was brought back. That is why one of the unanswered mysteries of KH3D is "What happened to Terra's heart and body?" If anything, Nomura was going over the whole thing thinking "how can I throw in another twist in the whole issue...oh right, lets bring back Xehanort as MX and otherwise keep total radio silence about Terra and/or Eraqus. The fans will surely go nuts and theorize/interpret like no tomorrow." When Ansem SOD and Xemnas were defeated, was Xehanort recompleted as MX? has to be answered with a clear and indisputable yes as it is an established fact so far. 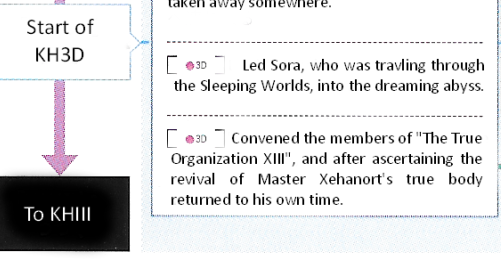 The second question is deliberately left unanswered to foster debate and theorizing and play up the "Terra/Eraqus/Xehanort"-mess even more as the unanswered mysteries quote from 3D shows. Considering Nomura's need to make everything "surprising" and fill some plotlines with more twists just for the heck of it, I'd bet this is just another of those cases. Nomura needs to learn that while sometimes answering a plottwist with another twist can be entertaining or even rewarding if done with caution, it has to be done sparingly and not by dropping a whole pileup of twists on every second plot point, lol.